Joonas from Khaosan World Asakusa here, with my first blog post! No particular plans for the evening? Did your flight arrive late? 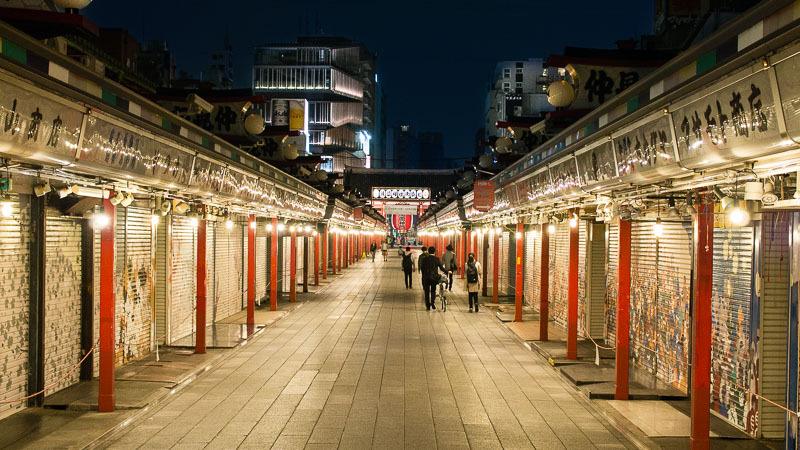 Get some blood flowing again after a long journey by taking a walk around the beautiful nighttime Asakusa! 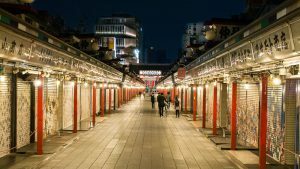 If you’re staying in Asakusa, a walk through one of the oldest shopping streets in whole Japan, the Nakamise-dōri, is a must! During the daytime the street is bustling with tourists and locals, and even though many of the shops and stalls close well before dark, the lights are left on over the night. The warm light bulbs hanging from the eaves create a beautiful, dreamy atmosphere that’s sure to leave a lasting impression. That’s why the Nakamise shopping street is worth visiting at least twice: both before and after the sunset! The difference is like night and day, literally! The Sensoji temple, first opened in the year 645, is also lit throughout the night, making a stroll through the shopping street to the temple district a beautiful experience. Especially photographers will also love the narrow alleys that Asakusa has in abundance! Only a couple of minutes walk from the Sensoji Temple is the Sumida River, from where you can see one of the most famous views in Tokyo. 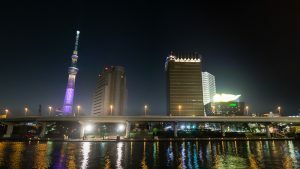 Standing on the other side of the river, the towering Tokyo Sky Tree shines in multiple colours in the horizon. The tower is at its best after the sunset, as it lights up in various beautiful light schemes. If you’re lucky, you might get to see some of the special light ones, such as the colour scheme commemorating the Olympic games of 2016 and 2020. 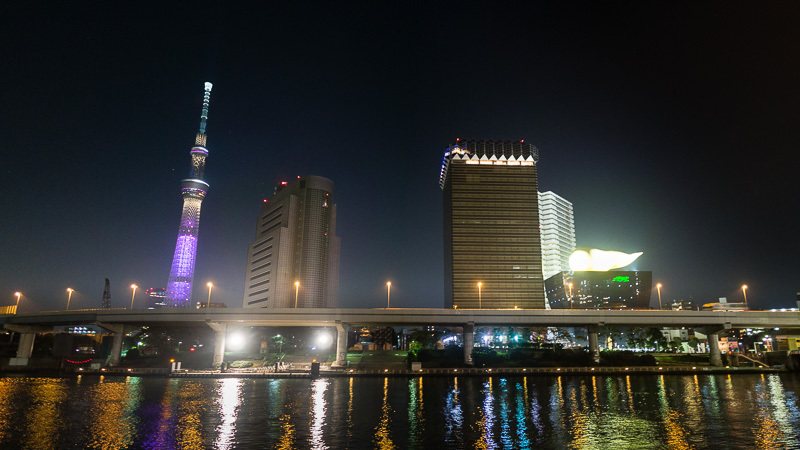 On the other side of the river, you can also see the headquarters of Asahi Breweries, resembling a foaming beer pint! Next to the office building is the world-famous Asahi beer hall, Flamme d’Or, which has divided the public opinion since it’s construction in 1989. Its unique look has earned it the nickname “Golden Poo”. 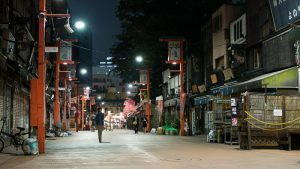 If you have an hour or so to spend in the evening, you should definitely go out for a stroll around the beautiful and atmospheric nighttime Asakusa! Everything seen here (and much more) is within 10 minutes walk from any Khaosan hostel in Tokyo! Also, remember to follow us on Facebook and Instagram for more information about sights, happenings and events in Asakusa!